You may not realize this, but when you look at the moon night after night, you only see the same side. Why is that? Read on to learn more about Earth’s moon. Why do we only see the same side of the moon each night? The short answer comes from the knowledge that the moon rotates at the same speed as the Earth. How did astronomers figure out that we see only one side of the moon? First, they had to answer why Earth’s rotation seemed to change. The change in the Earth’s rotational period was first measured using eclipses. Astronomers who studied the timing of eclipses over many centuries found that the Moon seemed to be accelerating in its orbit. Actually, the Earth’s rotation was slowing down. The effect was first noticed by Edmund Halley in 1695 and first measured by Richard Dunthorne in 1748. The moon’s shape help keeps it in sync with Earth. A “moon day,” the amount of time it takes for the moon to rotate around itself once, is about four weeks long. If the moon didn’t rotate at all, we would see all of its sides. It would alternately show its near and far sides to Earth. Its turning is the very reason that we see always see the same face of the moon. Looking at the image below, the moon on the right does not rotate. As a consequence, we would see all sides of the moon. The moon on the left spins at a rate that prevents us from seeing the back side. We know that the moon has an impact on Earth’s tidal phases. The moon raises tides on the Earth. The side of the Earth that faces the moon feels a strong gravitational pull at the center. The side of the Earth facing away from the moon feels a less gravitational pull. This effect stretches the Earth and is referred to as “tidal bulges”. Furthermore, the Earth’s physical appearance only changes a few centimeters, but the tides affecting the oceans is noticeable. Although the moon does not have any water, the gravitational pull from the Earth still creates a tidal effect. The distortion of Moon’s body is similar to Earth. Therefore, the Moon also has its tidal bulges. In fact, because of Earth’s greater mass, the tidal effect of the Earth on the Moon leads to Moon’s deformation close to 20m. 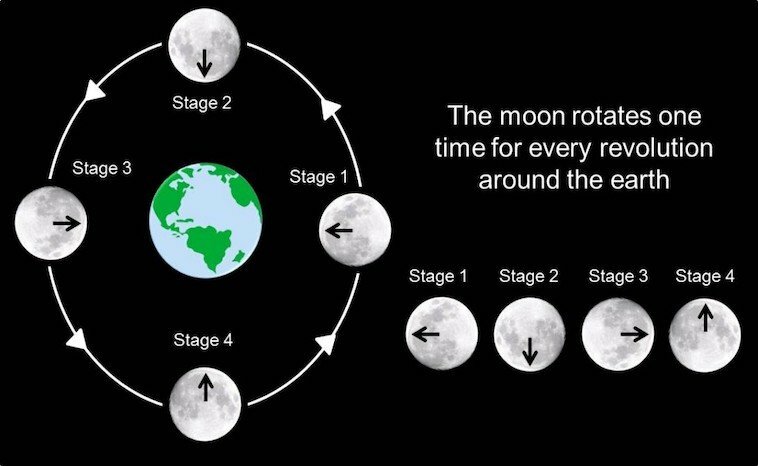 Slowing of the Moon’s rotation on its axis due to pull on the tidal bulge of the Moon by the Earth is another reason behind the tidal locking. The tidally distorted Moon orbits about the Earth, always keeping the same face and the long axis of its bulge towards the Earth. There are three ways for us to measure the effects of tidal friction. Measure the change in the length of the lunar month over time. This can be accomplished by examining the thickness of tidal deposits preserved in rocks, called tidal rhythmites. Measure the change in the distance between the Earth and the Moon. Scientists bounce lasers off reflectors left on the surface of the Moon by the Apollo astronauts. Measure the change in the rotational period of the Earth over time. Researchers use multiple radio telescope to measure the rotation of the Earth. The Very Long Baseline Interferometry technique measures the position of radio-bright objects. Since the rotating Earth carries the antennas along, these measurements can tell us the rotation speed of the Earth very accurately. Scientists believe the moon was molten, or hot liquid when it first formed. The side we cannot see cooled first and has more craters. The side we see has more radiation, although scientists do not know why. NASA and other space agencies would like to set up lunar stations. These stations would allow a more significant increase in knowledge about the moon and its mysteries.